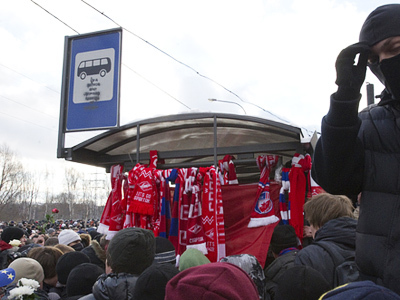 Security has been stepped up in Moscow due to a sanctioned rally in memory of a killed football fan, 28-year-old Egor Sviridov. He died in a brawl on December 7, 2010. 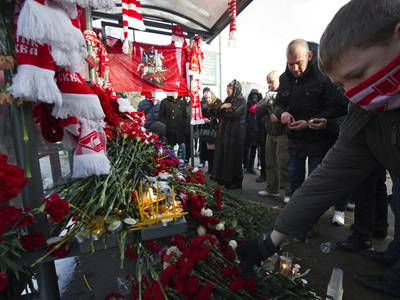 ­Forty days after the death of the Spartak Moscow supporter, more than a thousand people came to Kronshtadsky Boulevard in the north of Moscow, where he was murdered. These were mainly football fans, most of them covering their faces with the scarves of their football clubs or medical masks. There were fears that the gathering could turn violent, as was the case on December 11. 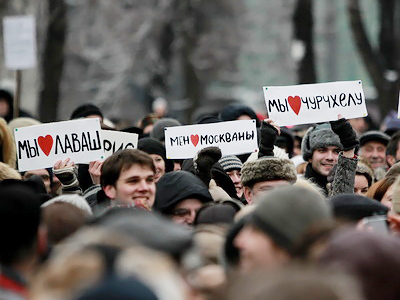 Back then the crowd moved from Kronshtadsky Boulevard to Moscow’s central Manege Square, where a mass brawl broke out, inflamed by nationalist slogans. The fuse was easy to ignite because Sviridov was killed in a scuffle with migrants from Russia’s North Caucasus. 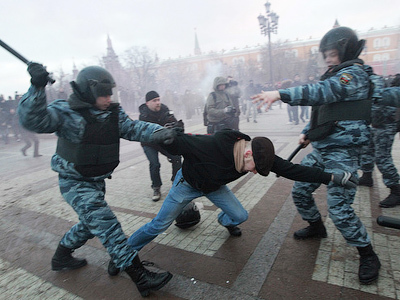 Moscow police have detained 19 people at the rally on Kronshtadsky Boulevard on Saturday. They have been checked for possible involvement in the December riot. A leader of the nationalist Movement against Illegal Immigration, Aleksandr Belov, laid a wreath at the bus stop where Sviridov died. Earlier, another leader of the movement, Vladimir Ermolaev, said that they do not attach any political meaning to the rally. A publication on its web site called on their supporters simply to come to the gathering to honor the memory of the perished young man. On Saturday, the Investigative Committee named the suspected instigators of the fight which resulted in Egor Sviridov’s death. According to the investigators, the brawl was “deliberately provoked” by Aslan Cherkesov, accused of the murder, and five more natives of the North Caucasus. The Investigative says none of the suspects are officially registered as migrants, and it is now trying to establish where they worked.. Five of them have been arrested and put in custody, and police are now searching for the sixth person allegedly involved in the fight on December 7. If found guilty, they face up to seven years in prison.